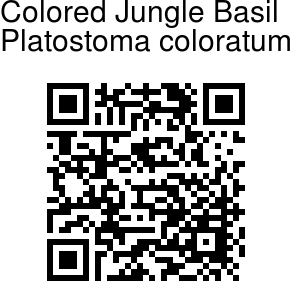 Colored Jungle Basil is a shrub about 2 m tall, with stems erect, scaly finely velvet-hairy. Leaf-stalks are less than 1 cm; leaf blade ovate-lanceshaped to lanceshaped, 5-8 × 2-3 cm, scaly finely velvet-hairy, base wedge-shaped, margin sawtoothed, tip tapering. Bracts ovate, less than 1 cm. Calyx about 2 × 1 mm, velvet-hairy, constricted at throat. Flower white with purple spots, about 5 mm, sparsely velvet-hairy, throat bell-shaped dilated, densely velvet-hairy, tube about 4 mm, limb nearly 2 lipped; upper lip 4-lobed, middle 2 lobes somewhat smaller than outer lobes; lower lip narrowly lanceshaped. Anterior stamens longer; filaments base slightly dilated, sparsely finely velvet-hairy; anthers ovoid. Nutlets dark brown, ovoid, tip finely bristly. 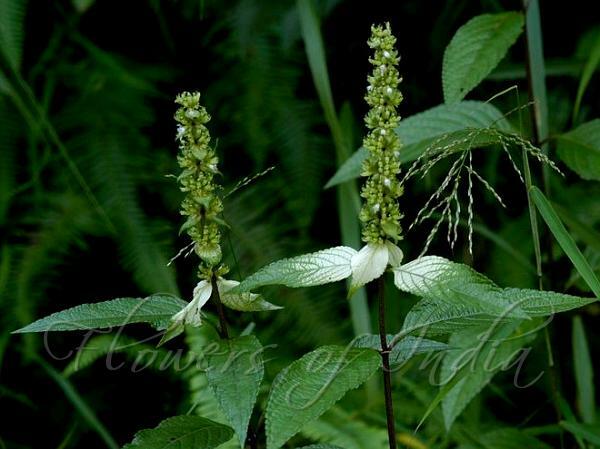 Colored Jungle Basil is found in shady valleys, thickets, in the Himalayas, from Garhwal to Bhutan, NE India, Bengal, Burma, SW. China and Indo-China, at altitudes of 150-1600 m. Flowering: September-October. Identification credit: J.M. Garg Photographed in Gori Valley, Uttarakhand.